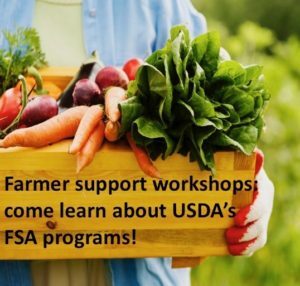 RFC is very excited to be partnering with USDA’s Farm Service Agency (FSA) and various other groups, including the National Young Farmers Coalition and SCORE, to offer growers information and training in how to search and apply for FSA support programs and loans. The series of workshops will run through February 2018. See RFC’s Facebook page for specific dates and locations.